Curtanna uniquely combines fun kinesthetic activities while building student’s cognitive skills and enhancing their affective attitudinal, self-esteem and social-emotional development. Curtanna’s program is endorsed and recommended by one of the world’s most recognized developmental cognitive neuroscientists: Dr. Adele Diamond from UBC, Canada. Curtanna exercises are dynamic and inclusive involving individual and team based activities resulting in engaging classes for all participants. Using our electronic platform, Curtanna accredited instructors prepare in advance for each class. Our content assures the integration of fun innovative activities, all focused on developing children’s critical life skills while playing. Curtanna is a fun and inclusive kinesthetic program for children in Grades 1 to 8. Through a mix of games and exercises, Curtanna directly addresses children’s core executive functions, improves their self-esteem, and their social-emotional skills to better equip them to thrive in life. Curtanna instructors are accredited through intensive training. Ongoing support is provided through our platform, with instructions and videos to prepare them for each class in advance. In-class usage of the platform allows to record real time participant’s assessed performance and progress. Through the innovation of Curtanna’s online platform and iPad app, the skills of fencing, a mentally-intensive sport, are turned into effective educational tools for institutions, clubs and community centers. Following the program’s guidelines and using the latest technology, Curtanna-accredited Instructors safely implement fun & innovative activities that develop critical life skills while playing. The Curtanna experience allows Instructors and Institutions to earn extra income while building students’ cognitive skills and enhancing their affective attitudinal, motivational and social development. The programs and exercises were designed by 3rd generation fencer, James Beevers, a 10-time British National Champion & Olympian. "Curtanna® vindicates many activities that helped us (from older generations) train, challenge and develop core executive functions during our early childhood. Those activities have disappeared today." Luis F. Ramirez, Founder and Principal CDI School, PY. 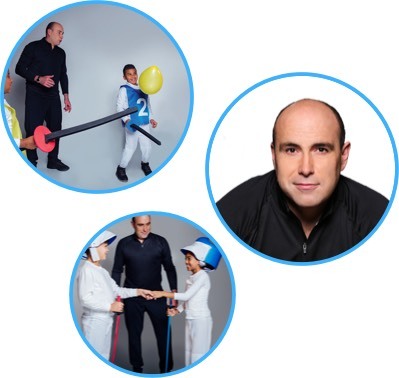 "While designing the program, James used the strategic thinking, inhibitory control, camaraderie, and playful components of fencing to help children develop skills to lead happy, productive lives." Adele Diamond, Tier 1 Cognitive Developmental Neuroscientist, University of British Columbia, Canada. Curtanna® allows you to safely implement a fun and innovative approach to youth sports and fitness programs by combining executive functions development with fencing.